Last update: 25th May 2018. Personal data will be collected and processed when using the contact form of this website, once the user has given his consent to this processing. The personal data obtained in this case are the name and email address of the user. Svenja Werner (please see the “About” for my contact details). At the moment, there is no need to having a data protection officer. The collected personal data when using the contact form are the email- address and the name of the user. These data will exclusively be processed to answer the questions of the user sent by him through the contact form, i.e. to send him one or more replies. Personal data will not be disclosed to anyone, unless required by law. (e) I, the controller, have no intends to transfer the personal data to a third country or international organisation. In case you have no prior commercial relationship with me, your contact details (name and email-address) are only stored until the communication purpose terminates, that is until your request is resolved, unless you have expressly authorized me to store your contact details for future communications. - You have the right to lodge a complaint with a supervisory authority, in my case with the Spanish Agency of Data Protection (Agencia Española de Protección de Datos). In the case you are interested in establishing a service contract with me, the provision of your contact details (name, email- address) is a requirement necessary to enter into a contract. In the case you are interested in establishing a service contract with me, please note that the provision of additional personal data (Tax Identification number, address) will also be a requirement necessary to enter into a contract. You are not obliged to provide any personal data, but please note that without having your name and email address, I cannot respond your questions and without having your Tax Identification number and address, I cannot carry out any services for you. (j) The data processing does not include any automated decision-making or profiling. In the event that you agree that I may process your personal data for a purpose other than that for which it was originally collected (for example, to send you information and news via a newsletter), I will give you all relevant information about this processing prior to this processing. Your personal data will be processed lawfully, fairly and in a transparent manner. Without further notice from your side, I understand that your personal data is accurate and up to date. You accept to inform me about any modification of your personal data and I will take every reasonable step to ensure that personal data that are inaccurate, are erased or rectified without delay. Likewise, I will erase the data when they are no longer necessary or pertinent for the purpose they were collected, in accordance with the provisions of Organic Law 15/1999, of December 13, on the Protection of Data of Personal character (LOPD). As the controller of your personal data, I undertake to comply with my obligation of secrecy with respect to the personal data provided and the duty to treat them with confidentiality and reserve, in accordance with current legislation. For these purposes, I will adopt the necessary measures to avoid its alteration, loss, treatment or unauthorized access. As well, I adopt the corresponding security measures required by the current applicable regulations, especially the Organic Law on Data Protection 15/1999 and the General Data Protection Regulation (EU) 2016/679. However, I do not assume any responsibility for the damages and losses derived from alterations that third parties may cause in the computer systems, electronic documents or files of the user. The provider of the website automatically collects and stores information in so-called server log files, which your browser automatically transmits to us. This information includes the request, the IP address, browser type and language, and the date and time of the call. The information is used to analyse and maintain the technical operation of the servers and the network and to combat abuse and will be automatically deleted after 3 months. This site uses https encryption (TLS) for security reasons and to protect the transmission of sensitive content, such as requests you send to me as a site operator. For this the free service "Let's Encrypt" is used. By integrating the encryption certificates, a so-called transport encryption can be enabled. If encryption is enabled, the data you submit to me can not be read by third parties. You can recognize an encrypted connection by changing the address line of the browser from "http: //" to "https: //" and the lock symbol in your browser line. The User has the possibility to configure his browser to be notified of the reception of cookies and to prevent their installation on his computer. In each browser the operation is different, so please consult the instructions and manuals of your browser to expand this information. Modify your browser settings to restrict or block Svenja Werner's cookies at any time (please see links to some browser manuals above). In the case of restricting or blocking cookies, the functionalities of the website may be reduced. The purpose of this web page is to provide the public, in general, with knowledge of the activities carried out and the services provided by Svenja Werner. The services provided by Svenja Werner are aimed at people over 18 years of age. The access and / or use of the website of Svenja Werner attributes the condition of User. The use of this website implies the express and full acceptance of the conditions set forth herein, without prejudice to any particular conditions that may apply to some of the specific services offered through the website. If the User is not satisfied with the clauses and conditions of use of this website, he is kindly asked to refrain from using the Page. The User agrees and undertakes not to transmit, disseminate or make available to third parties any kind of material contained in the Page, such as information, texts, data, content, messages, graphics, drawings, image files, photographs, software, logos, brands, icons, technology, links, graphic design and source codes, or any other material that he has access to as a User of the Page, without this enumeration being of a limiting nature. Reproduce, copy, distribute, make available or otherwise publicly communicate, transform or modify the Contents, unless he has the written and explicit authorization of Svenja Werner, who is the owner of the corresponding rights, or because it is legally allowed. Delete, manipulate or in any way alter the "copyright" and other data identifying the reservation of rights of Svenja Werner or its owners, fingerprints and / or digital identifiers, or any other technical means established for its recognition. Given the dynamic and changing environment of the information provided through the website, Svenja Werner makes her best effort, but does not guarantee the complete truthfulness, accuracy, reliability, usefulness and / or timeliness of the contents. The information contained in the pages that make up this website is only informative, advisory and advertising. In no case does it offer or has the nature of a binding or contractual commitment. In order to keep the information published on the website updated, the contents thereof may be modified, corrected, deleted or added at any time and without prior notice. Likewise, Svenja Werner reserves the right to make, modify and update the configuration and presentation of the website. The service of the website and the contents has, in principle, an indefinite duration. Svenja Werner, however, is authorized to terminate or suspend the provision of the website service and / or any of the contents at any time. When it is reasonably possible, Svenja Werner will previously advise the termination or suspension of the webpage. The use of the contact information published in the context of the imprint obligation for sending unsolicited advertising and information materials is hereby rejected. The operator of the pages expressly reserves the right to take legal action in the event of the unsolicited sending of advertising information, such as spam e-mails. All the elements that make up the website, such as its structure, design, source code, as well as the logos, trademarks, trade names and other distinctive signs that appear on it, are the property of Svenja Werner or third parties that have authorized their use and are protected by the corresponding intellectual and industrial property rights. Likewise, the contents of the website, such as texts, photographs, images and other graphic elements, are protected by the corresponding intellectual and industrial property rights. The use or access to the website and / or the contents does not give the User any rights over the aforementioned trademarks, trade names and / or distinctive signs, neither is the User assigned any of the exploitation rights that exist or may exist on said contents. The unauthorized use of the information contained in this website, as well as the infringement of the intellectual or industrial property rights of Svenja Werner or third parties included in the page that have transferred content will give rise to the legally established responsibilities. All information received on the web, such as comments, suggestions or ideas, will be deemed to be assigned to Svenja Werner free of charge. No information should be sent that can not be treated in this way. It is the holders of the rights of intellectual and industrial property to whom the exclusive exercise of the exploitation rights of the same belong in any form. The use of the contents must respect their particular licensing, so its use, reproduction, distribution, modification, assignment, public communication, transformation or any other similar or analogous activity, is totally forbidden unless prior and express authorization from Svenja Werner. Svenja Werner is expressly cited as the source and origin of those. The purpose of such use is compatible with the purposes of the website and / or the activity of Svenja Werner. Any other use must be communicated and authorized by Svenja Werner, previously and expressly. Users who access this website may view the contents and, where appropriate, make authorized private copies provided that the reproduced elements are not subsequently transferred to third parties, nor are they installed to servers connected to networks, nor are they subject to any type of exploitation. Regarding the services of third parties, Svenja Werner acknowledges in favor of its owners the corresponding rights of industrial and intellectual property, not implying their mere mention or appearance on the Web the existence of rights or any responsibility on them, nor support, sponsorship or recommendation. Svenja Werner declares her respect for the intellectual and industrial property rights of third parties; therefore, if you consider that this website may be violating your rights, please contact me. Both the access to the website of Svenja Werner and the use that may be made of the information contained therein is the sole responsibility of the person who carries it out. Svenja Werner does not guarantee the absence of interruptions or errors in accessing the page or its contents. Consequently, Svenja Werner is not liable for damages or losses of any kind caused to the User that are caused by failures or disconnections in the telecommunications networks that produce the suspension, cancellation or interruption of the service of the website during the provision of the service or prior to it. The access to the site does not imply an obligation on the part of Svenja Werner to control the absence of viruses, worms or any other harmful computer element. The User is responsible, in any case, for the availability of adequate tools for the detection and disinfection of harmful computer programs, therefore, Svenja Werner is not liable for possible security errors or for possible damages that may occur in the User's computer system (hardware and software) or the files or documents stored therein, as a consequence of the presence of viruses in the User's computer used for the connection to the services and contents of the Web, or of a malfunction of the browser or the use of non-updated versions of it. Svenja Werner does not guarantee the absence of errors in the content of the website, nor that it is updated, although she will develop her best efforts to, in its case, avoid, correct or update them. Svenja Werner reserves the right to make changes to the website without prior notice, in order to keep the information updated, adding, modifying, correcting or eliminating the published content or the design of the website. Svenja Werner will not be responsible for the use that third parties make of the information published on this website (e.g. for decisions that the User may make based on the published information), nor for the damages suffered or economic losses that, in a direct or indirect way, produce or may cause economic, material or data damage, caused by the use of such information. The links contained in this web page can direct to contents in Web pages of third parties. The purpose of these links is only to facilitate the search for resources that may interest the user through the Internet. However, these pages do not belong to Svenja Werner, nor does she review their contents and, for this reason, Svenja Werner does not assume any responsibility for the content, information or services that may appear on these sites, which will be exclusively informative. In no case do they imply any relationship between Svenja Werner and the persons or entities holding such content or owners of the sites where they are located. Svenja Werner can not be held responsible for the correct operation of the linked page or the possible damages that may arise from the access or use of it. Svenja Werner does not suggest, nor invite or recommend the visit of the linked sites, so she will not be responsible for the result obtained. Svenja Werner is not responsible for the establishment of hyperlinks by third parties. The establishment of the link will not imply any agreement, contract, sponsorship or recommendation by Svenja Werner of the page that makes the link. Those persons who intend to establish a hyperlink must previously request express and unequivocal written authorization from Svenja Werner. Prior authorization will not be necessary when the hyperlink only allows access to the home page, but it may not reproduce it in any way. The web page on which the hyperlink is established will not contain information with contents that are illegal, discriminatory, contrary to commonly accepted ethical principles or attempt against public order, nor contain contents contrary to any rights of third parties. The web page on which the hyperlink is established will not make false, inaccurate or incorrect statements or indications about Svenja Werner. Svenja Werner may request that a link to her website is removed, without the need to claim any cause. In this case, the page that made the link should proceed to its immediate deletion, as soon as it receives the notification from Svenja Werner. Svenja Werner is not responsible in any way, nor guarantees the quality, accuracy, reliability, correctness or morality of content or services that the establishment of the hyperlink can offer. The User assumes under his / her own responsibility the consequences, damages or actions that may arise from access to the web page of the hyperlink. 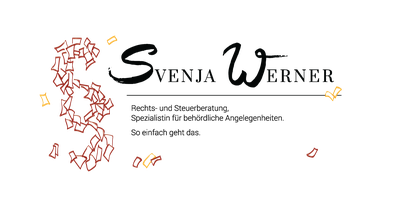 The web page on which the hyperlink is established may not contain any trademark, denomination, logo, slogan or other distinctive signs belonging to Svenja Werner except those signs that form part of the hyperlink. Svenja Werner expressly prohibits the realization of "framings" or the use by third parties of any other mechanisms that alter the design, original configuration or contents of this website. For the resolution of any conflict that may arise during the visit to the website or the use of the services that may be offered in it, Svenja Werner and the User agree to submit to the Judges and Courts of domicile of the User, provided that he acts as a consumer. Otherwise, the submission will be to the courts and tribunals of the city of Madrid, Spain. My e-mail address is svenjaATsvenjawernerDOTcom.